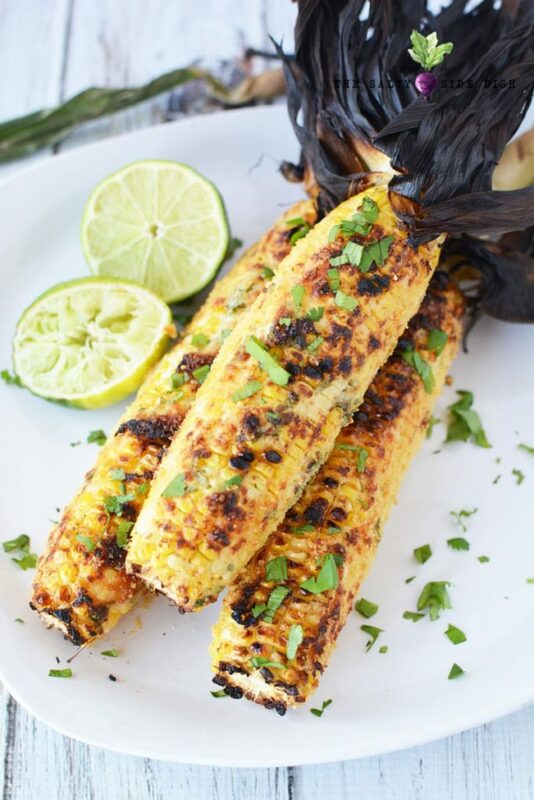 Dripping in salty perfection, Mexican street corn (on the cob) is about as delicious as it gets. Not just a side dish, you can crunch down on this easy to make corn pretty much any day of the week. Let’s fire up the grill and get cookin! Little fun food fact- Cinco De Mayo has nothing to do with beer, chips, and salsa (no, for real, read the history of Cinco De Mayo) but since it evolved to that in the good ole United States, who am I to discharge a great reason to enjoy salsa, guacamole and Mexican street corn? I love fresh corn, right off the cob, shaved off into salads and chunky salsas. And although my family is weird and can do without, being right on the cob is simply heaven to this mama. 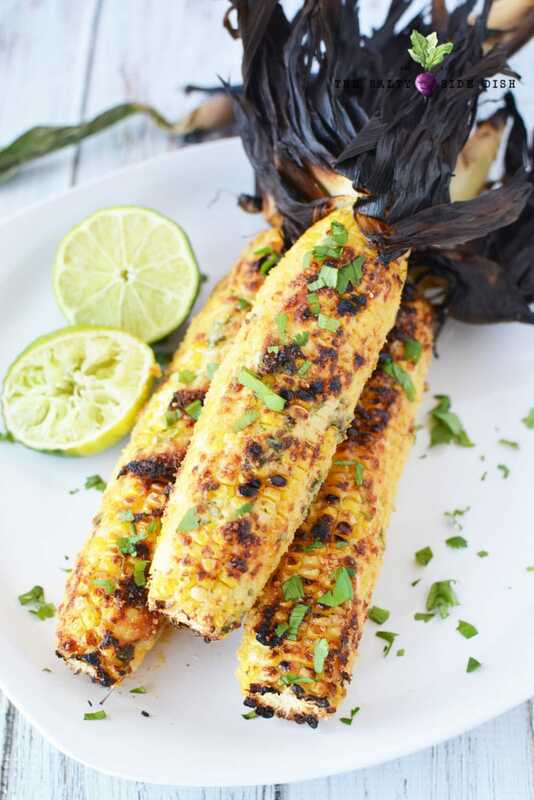 And bonus when its on the grill like this Mexican street corn recipe is. 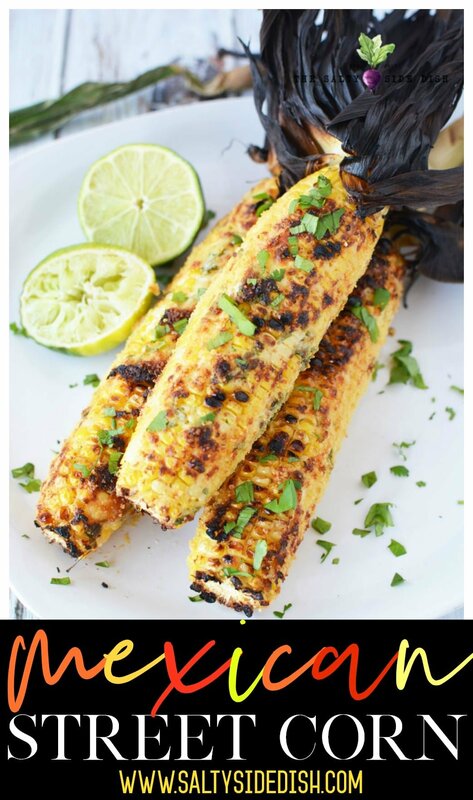 Dripping with perfect seasonings and that wonderful savory grill taste, you will be salivating waiting out this corn, which can be a dinner on its own. 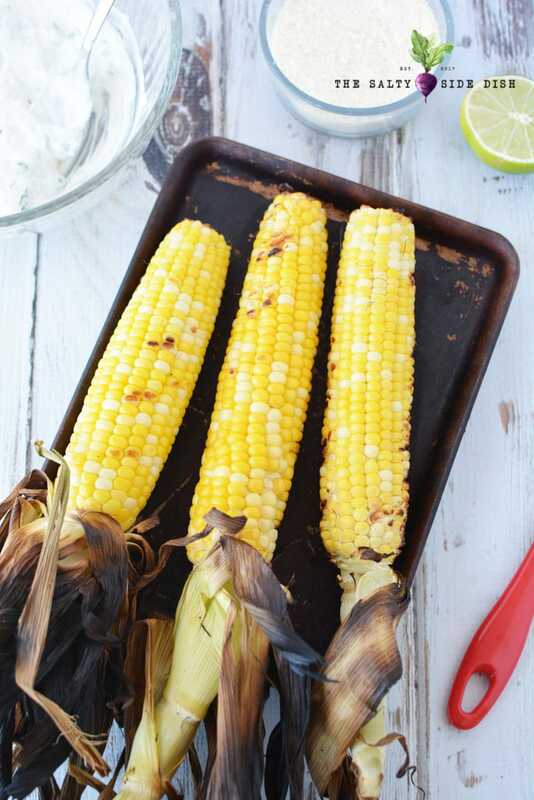 A flawless side dish, don’t be afraid to mow down all the corn fields and line up the grill with perfectly beautiful corn kernels that will fly from the table once set out. Plus for me personally, making food on the grill is about as homemade as it gets since you have to wait it out and the slow cooking and heating of the food keeps it even and crisp. 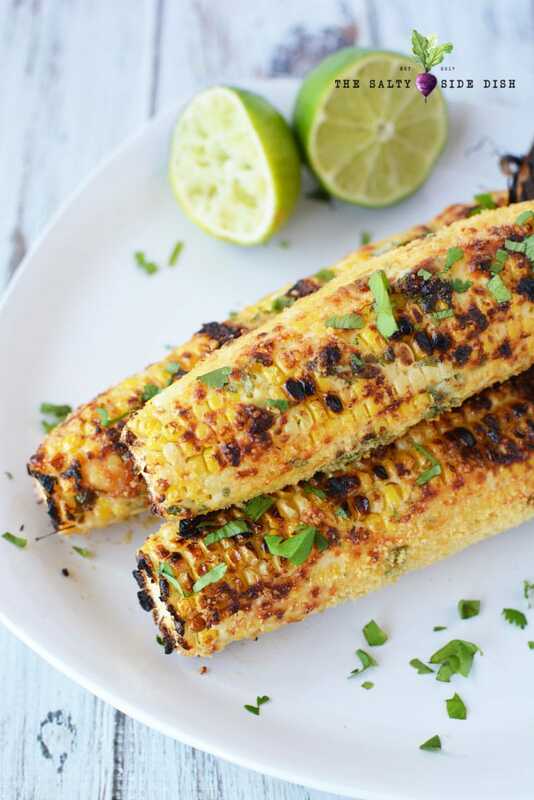 This grilled Mexican street corn is one way to bring the taco truck to your backyard! Throw these prior to prepping your other food as they can take some time to heat up and get soft enough to eat. You can also make extra corn to shave into this black bean and corn salsa! 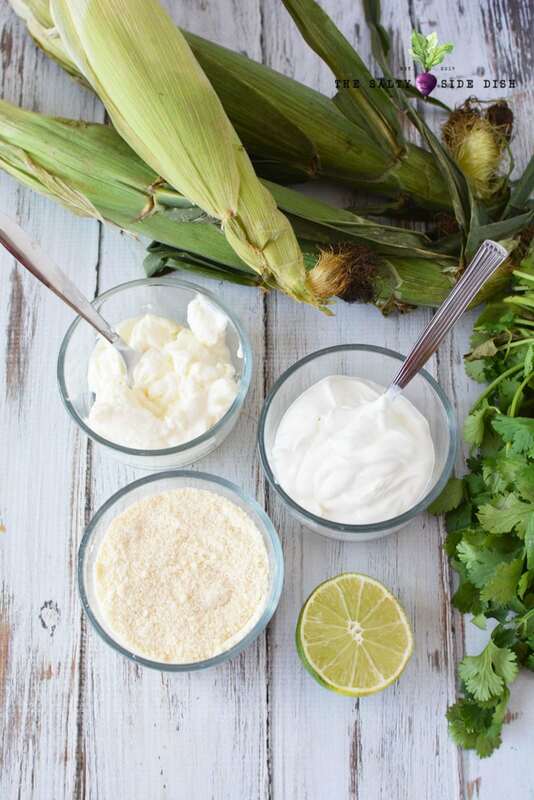 This recipe is specifically to enjoy eating off the cob, but you can also take the long way and shave off your corn to create a really authentic corn soup, salsa, or plain old corn in a cup! Either way, hello– yum! Preheat an outdoor grill (the lid thermometer said 350-400 degrees on ours). 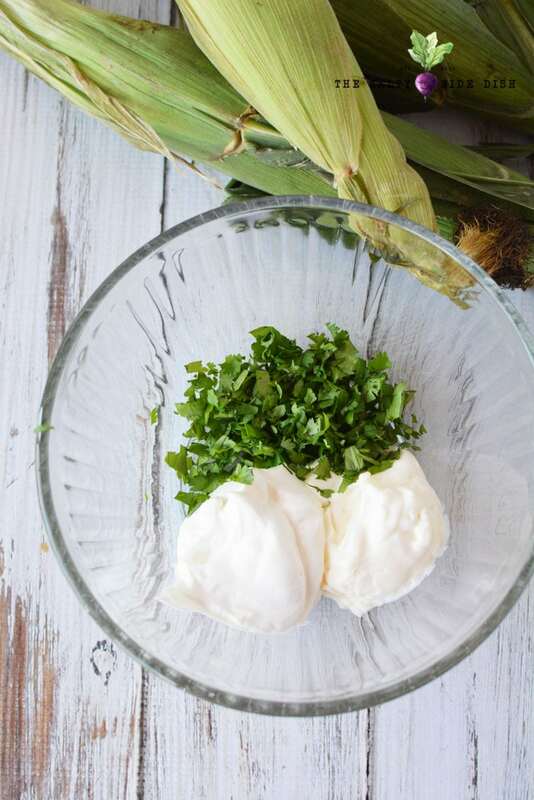 In a mixing bowl, add mayonnaise, sour cream and 1/4 cup cilantro in a large bowl. Remove husks of corn on cob, or pull back and leave on. Remove corn silk and discard. Place corn on grill and heat for 10-15 minutes, rotating corn halfway through cooking. Corn should be bright and yellow when done. 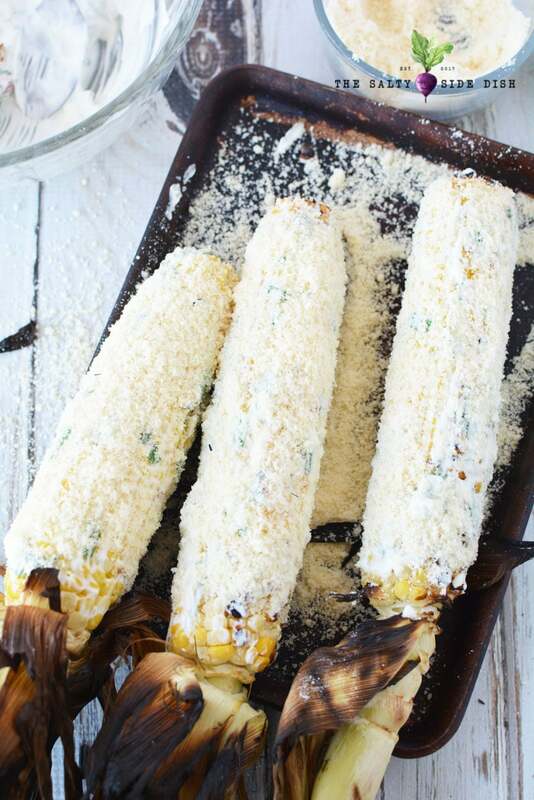 Remove corn from grill and use a basting brush to spread the mayonnaise mixture onto the corn. 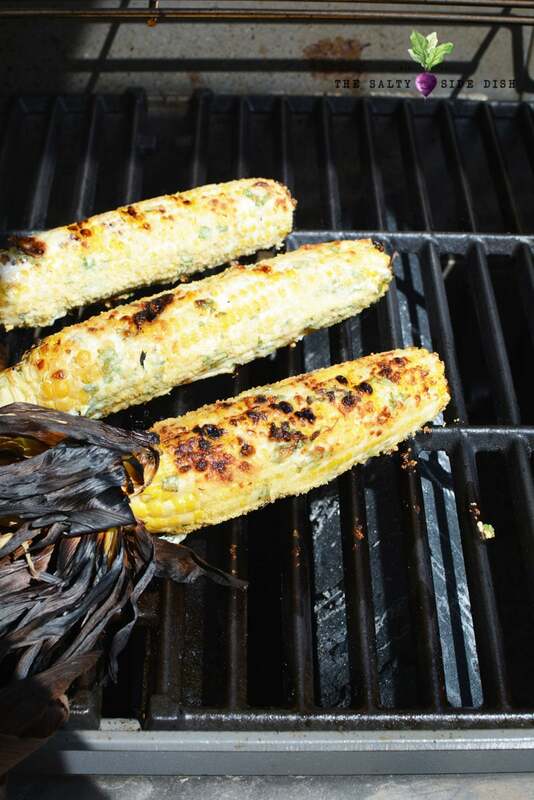 Return corn to the grill and heat an additional 5-10 minutes, rotating frequently to cook on each side. Serve sprinkled with juice of lime, chopped cilantro and red chili powder if desired. Plus do not forget to visit these other easy side dish recipes! 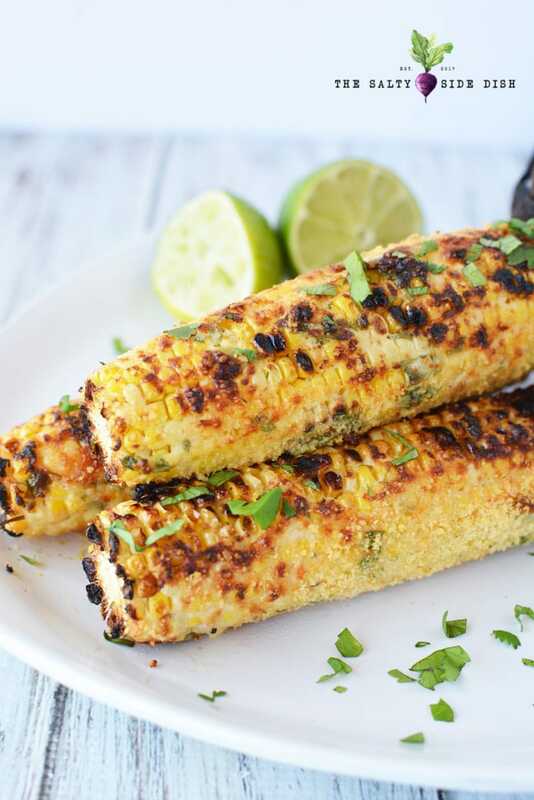 Mexican street corn (on the cob) is about as delicious as it gets, Dripping in salty perfection and a perfect slathering of mayo and cheese, street corn is not just a side dish, you can crunch down on this easy to make corn pretty much any day of the week. Let's fire up the grill and get cookin! In a mixing bowl, add mayonnaise, sour cream and 1/4 cup cilantro in a large bowl. Set aside. Remove husks of corn on cob, or pull back and leave on. Remove corn silk and discard. Place corn on grill and heat for 10-15 minutes, rotating corn halfway through cooking. Corn should be bright and yellow when done. 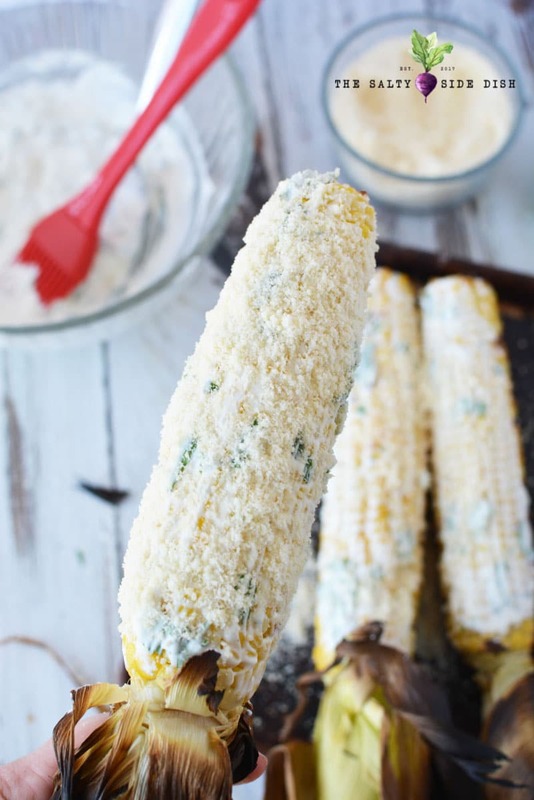 Remove corn from grill and use a basting brush to spread the mayonnaise mixture onto the corn. Sprinkle generously with Parmesan cheese.